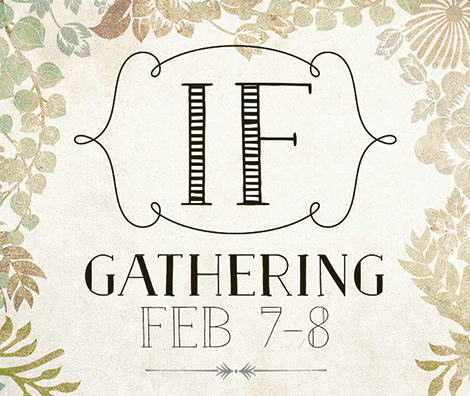 For those of you who are able to join us this Friday and Saturday for the IF:Gathering – Athens, we can’t wait to see you! If you haven’t had a chance to learn about “The Story of IF”, click here and listen to Jennie Allen and Lindsey Nobles share the vision of the IF:Gathering. You’ll be encouraged by their faithfulness and even more excited about this weekend’s gathering. And even if you can’t make it to the retreat, there are great reads worth checking out on the blog. Each week, the IF team posts ‘GOOD READS’ - collections of powerful words by other authors. Check them out and be encouraged and/or kicked in the rear. Join us in praying for this weekend and the ladies of Christ Community Church – that we continue to grow together in a culture of honesty and trust where women are reminded of how good, great, gracious, and glorious God is.